After achieving a Magister Artium (M.A.) degree in languages and history in 1990, Manuela worked for many years as teacher for adults and interpreter. She has spent many months in South Italy in rural areas where she learned about the challenges of missing jobs and education, poverty, destructive housing /environmental campaigns. In 1997, she joined Boehringer Ingelheim where she focused on digital communications and marketing activities for more than 12 years. She developed and implemented global Internet strategies and a Content Management system for BI worldwide from business perspective and gained a huge experience in digital and community/crowd-based approaches. 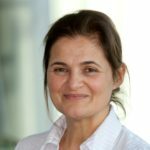 In 2013, Manuela joined Boehringer Ingelheim’s initiative Making More Health (MMH), a long-term initiative launched by Boehringer Ingelheim in partnership with Ashoka in 2010. This initiative aims to improve health around the world by supporting social entrepreneurs and change-making ideas that creates win – win situations while linking the social to the business world. Today, she leads and develops further this initiative on a global level, runs disruptive leadership weeks for high level managers of the own, but also other companies in rural India and has set up several social entrepreneurial projects in rural India and Kenya. She has represented MMH as a speaker on many national and international conferences and a huge network to the NGO/social entrepreneurial sector.